I have started a new policy. 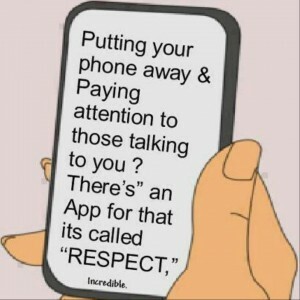 If your child is not willing to put the phone down, I will come back when they will. I will not compete with electronics. I feel it is so sad that I have to do something like this when parents should be the ones teaching their children what is right and wrong. The phones can also interfere with medical equipment! Here’s a great resource for my patients and their families, exclusively for members of affiliated medical practices, colleges/universities or companies. I just signed up today! To join, please email me your full name, email address, telephone number, best time and date for an intake interview. Join me in a great step for your health! Renew Fitness and Nutrition believes proper diet and exercise are essential for today’s lifestyle. Our state-of-the-art program, designed by our staff registered dietician and professional fitness trainer, uses education, access to fitness and nutrition professionals, easily achievable action steps, and small group support systems to help your patients attain and maintain a healthy lifestyle. January is coming to an end. If you’re having trouble keeping your health goals, Dr. Annette St. Pierre-Mackoul discusses ways to get yourself back on track. The poor children of Southwest Florida are being hit hard by Strep Throat, Influenza and a host of other illnesses! Try to keep healthy by good handwashing, getting at least 10 hours of sleep per night, take your vitamins daily, and brush twice a day / floss daily / and rinse with mouthwash twice a day. Cover your mouth and nose when coughing and sneezing. We all know that there is a problem with childhood obesity and lack of physical activity outside of school for our kids. I want to throw out an idea and I really hope it will take off. I am willing to get personal trainers at my office 5 days a week – I hope to get up to 7 days a week eventually. Everyday at 4:30, I will have the children register and weigh in (if they don’t want to weigh in, t……hat’s fine – but I will privately have each check in and get their pulse, blood pressure and temperature). Then we will have an activity daily from 5 until 6 pm. I encourage the parents to work out with their children, not just drop them off. This will not be a babysitting program, if your child is not well behaved without you, they may not stay without you. I will be participating daily as well. Who’s interested? Message me on Facebook, Twitter, Linked In or call the office at 415-1131 and tell them how many people are interested. When I have all the details worked out, I will let you know. This will be free and open to all!